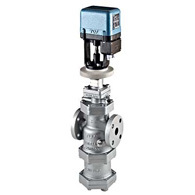 Automatic multi-control valves consisting of pilot-operated pressure reducing valves with built-in separator and trap to supply dry steam. Together with TLV's reliable controller, valves maintain accurate control at the target pressure, temperature, etc. By combining with TLV controllers SC-F70 or SP-F70, the rapid response brushless motor precisely adjusts the valve position to ensure extremely accurate pressure or temperature control, even in adverse process conditions. Self-learning function and pilot operated pressure reducing valve as a base, no over shooting when the set valve changes. Built-in cyclone separator, with condensate separation efficiency as high as 98%, and self modulating Free Float® steam trap provide dry high quality steam. For steam processes requiring dry high quality steam with precision control of pressure or temperature.